Most countries have their own currencies, but not all. Sometimes small economies use the currency of an economically larger neighbor. For example, Ecuador, El Salvador, and Panama have decided to dollarize—that is, to use the U.S. dollar as their currency. Sometimes nations share a common currency. The best example of a common currency is the Euro, a common currency used by 19 members of the European Union. With these exceptions duly noted, most international transactions require participants to convert from one currency to another when selling, buying, hiring, borrowing, traveling, or investing across national borders. The market in which people or firms use one currency to purchase another currency is called the foreign exchange market. Every exchange rate is a price—the price of one currency expressed in terms of units of another currency. The key framework for analyzing prices, whether in this course, any other economics course, in public policy, or business examples, is supply and demand in markets. Watch this video for a brief introduction to the foreign exchange market (or forex). Table 1 shows the currencies most commonly traded on foreign exchange markets. The foreign exchange market is dominated by the U.S. dollar, the Euro, the Japanese yen, and the British pound. In foreign exchange markets, demand and supply become closely interrelated, because a person or firm who demands one currency must at the same time supply another currency—and vice versa. To get a sense of this, it is useful to consider four groups of people or firms who participate in the market: (1) firms that import or export goods and services; (2) tourists visiting other countries; (3) international investors buying ownership (or part-ownership) in a foreign firm; (4) international investors making financial investments that do not involve ownership. Let’s consider these categories in turn. Firms that sell exports or buy imports find that their costs for workers, suppliers, and investors are measured in the currency of the nation where their production occurs, but their revenues from sales are measured in the currency of the different nation where their sales happened. So, a Chinese firm exporting abroad will earn some other currency—say, U.S. dollars—but will need Chinese yuan to pay the workers, suppliers, and investors who are based in China. In the foreign exchange markets, this firm will be a supplier of U.S. dollars and a demander of Chinese yuan. International tourists need foreign currency for expenses in the country they are visiting; they will supply their home currency to receive the foreign currency. For example, an American tourist who is visiting China will supply U.S. dollars into the foreign exchange market and demand Chinese yuan. Financial investments that cross international boundaries, and require exchanging currency, are often divided into two categories. Foreign direct investment (FDI) refers to purchasing (at least ten percent) ownership in a firm in another country or starting up a new enterprise in a foreign country. For example, in 2008 the Belgian beer-brewing company InBev bought the U.S. beer-maker Anheuser-Busch for $52 billion. To make this purchase of a U.S. firm, InBev had to supply euros (the currency of Belgium) to the foreign exchange market and demand U.S. dollars. Portfolio investment is often linked to expectations about how exchange rates will shift. Look at a U.S. financial investor who is considering purchasing bonds issued in the United Kingdom. For simplicity, ignore any interest paid by the bond (which will be small in the short run anyway) and focus on exchange rates. Say that a British pound is currently worth $1.50 in U.S. currency. However, the investor believes that in a month, the British pound will be worth $1.60 in U.S. currency. Thus, as Figure 2(a) shows, this investor would change $24,000 for 16,000 British pounds. In a month, if the pound is indeed worth $1.60, then the portfolio investor can trade back to U.S. dollars at the new exchange rate, and have $25,600—a nice profit. A portfolio investor who believes that the foreign exchange rate for the pound will work in the opposite direction can also invest accordingly. Say that an investor expects that the pound, now worth $1.50 in U.S. currency, will decline to $1.40. 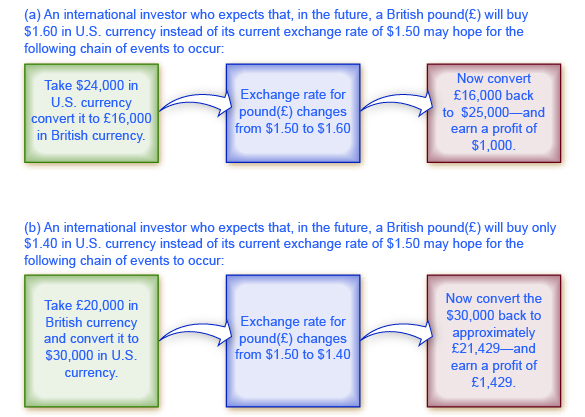 Then, as shown in Figure 2(b), that investor could start off with £20,000 in British currency (borrowing the money if necessary), convert it to $30,000 in U.S. currency, wait a month, and then convert back to approximately £21,429 in British currency—again making a nice profit. Of course, this kind of investing comes without guarantees, and an investor may suffer losses if the exchange rates do not move as predicted. Figure 1. A Portfolio Investor Trying to Benefit from Exchange Rate Movements. Expectations of the future value of a currency can drive demand and supply of that currency in foreign exchange markets. Many portfolio investment decisions are not as simple as betting that the value of the currency will change in one direction or the other. Instead, they involve firms trying to protect themselves from movements in exchange rates. Imagine you are running a U.S. firm that is exporting to France. You have signed a contract to deliver certain products and will receive 1 million euros a year from now. But you do not know how much this contract will be worth in U.S. dollars, because the dollar/euro exchange rate can fluctuate in the next year. Let’s say you want to know for sure what the contract will be worth, and not take a risk that the euro will be worth less in U.S. dollars than it currently is. You can hedge, which means using a financial transaction to protect yourself against currency risk. Specifically, you can sign a financial contract and pay a fee that guarantees you a certain exchange rate one year from now—regardless of what the market exchange rate is at that time. Now, it is possible that the euro will be worth more in dollars a year from now, so your hedging contract will be unnecessary, and you will have paid a fee for nothing. But if the value of the euro in dollars declines, then you are protected by the hedge. Financial contracts like hedging, where parties wish to be protected against exchange rate movements, also commonly lead to a series of portfolio investments by the firm that is receiving a fee to provide the hedge. The foreign exchange market is huge not because of the demands of tourists, firms, or even foreign direct investment, but instead because of portfolio investment and the actions of interlocking foreign exchange dealers. International tourism is a very large industry, involving about $1 trillion per year. Global exports are about 23% of global GDP; which is about $18 trillion per year. Foreign direct investment totaled about $1.4 trillion in 2012. These quantities are dwarfed, however, by the $5.3 trillion per day being traded in foreign exchange markets. Most transactions in the foreign exchange market are for portfolio investment—relatively short-term movements of financial capital between currencies—and because of the actions of the large foreign exchange dealers as they constantly buy and sell with each other. This video clip will give you an example of how money is exchanged on the foreign exchange market and how that affects international trade. We’ll dig into some of the concepts in further detail in the readings that follow.